Nestled perfectly on 12.2 secluded and private acre in the exclusive community of The Dominion is where you will find this one of a kind, hand-crafted, Bill Tull Estate. Custom built and redefining Sante Fe luxury, this flawless residence offers relaxed living with remarkable views fit for a king. 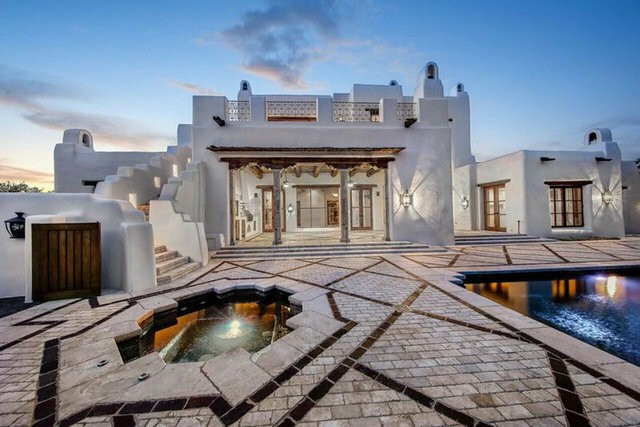 World renowned artist, Bill Tull of Arizona's crew relocated to San Antonio for two years to build this substantial estate. Imported adobe construct this rare estate and it is here you will discover the endless attention to details can be found around every corner. Upon entry, you will find two of fourteen hand-sculpted fire places. Onward throughout the house, all designed by Bill Tull are stained glass windows, saguaro cactus rib shutters, vanity mirrors, light sconces, hand-crafted tile, corbels, and Bill's custom designed copper bar top. Exposed adobe walls allow you to appreciate the "art" that is behind the hand plastered walls. Custom long leaf yellow pine hardwood floors and a 4" concrete overlay are a dream throughout this space. Enjoy entertaining in this estate masterfully designed to capture and blend indoor and outdoor spaces effortlessly providing the ultimate entertaining venue. Relax in the lavish owners retreat complete with two hand-sculpted fireplaces. This space also features separate his and hers bathrooms each with their own entry and seperate closets. Additionally, two en suite oversized guest bedrooms all with customized baths, an exercise room with a sauna and a separate casita that offers a completely self contained living experience. The infinity edge pool and spa with a mosaic finish overlooks picturesque views of Downtown San Antonio and the Texas Hill Country Art, Life, and Exceptional views are encapsulated in this sophisticated masterpiece designed and hand-crafted by the acclaimed Arizona Designer, Bill Tull.